Calphalon Classic is their "flagship" cookware. It's covered by a lifetime warranty (as opposed to the 10-year warranty you get on the Simply Calphalon line which is the more budget-friendly collection). I use the jelly roll pan more for cookies than roll-style cakes - is there really a difference between a jelly roll sheet and a regular baking sheet? It is simply a great all-around backing pan. I'm going to invest in another one so I can double my cookie-making capacity. 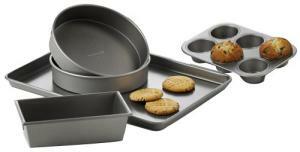 One other feature to note: The bakeware's medium gray color creates the perfect amount of browning. Perfect!